The Lucas Scholars Program provides under-served students access and experience with innovative technology in a project-based learning environment that supports joy and exploration. The Lucas Scholars Program is a five-day summer program at St. Matthew’s Parish School in Pacific Palisades, CA. It is completely free of charge to all students. The program started in 2013 with twenty sixth and seventh grade participants from the Venice Boys and Girls Club and expanded in 2014 to include scholars from the Neighborhood Youth Association. In our fifth year of operation, we are excited to continue our partnership with the the Neighborhood Youth Association, KIPP Innovation Academy in East Los Angeles, Saint Anne School of Santa Monica as well as work with Empowher students from Inglewood and Gardena. For the 2017 program we welcomed thirty four scholars. Lucas Scholars experience an interactive, project-based learning format found in the very best independent schools across the country. Many of the projects made by students involve the latest technology. The program involves students developing important technological skills – for example, proficiency with iMovie – and receiving education in fundamental scientific disciplines, such as chemistry and biology. These “learning modules” then inform and motivate students to pick a field and design a novel experiment or project. Students collaborate on their experiments and presentations in periods called “Scholar Blocks” where they work closely with their assigned mentor or mentors. The experience at St. Matthew’s does not end in the classroom, however. Built into the schedule is an advisory time at the end of the day to build the relationship between the mentors and students, and an hour at lunch for different sports options, including swimming. After a week of preparation, on Friday students host their families at an evening BBQ and multimedia presentation of their results in a science exhibition format. In addition, there will be a graduation ceremony for students, family, faculty, and program supporters. Our powerful project-based learning techniques, combined with leading-edge technology and top-notch mentorship inspires our scholars and gives them the tools to be successful in the fields of science and technology, or wherever else their academic interests lead them. To continue to foster students’ interest in science and technology, and to extend and deepen the learning process, we feel the educational experience should not end for Lucas Scholars when they graduate. Mentors follow up with the students at specific intervals throughout the school year (e.g., vacation breaks) to offer our mentorship, support and supplemental activities. 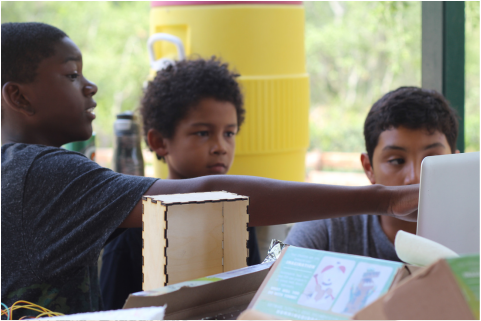 Additionally, Lucas Scholars continue to have access to Hummingbird Robotic kits at the Boys and Girls Club and Neighborhood Youth Association to facilitate continued learning after graduation. It has been found that continued use of technology can increase self-esteem, motivation, collaboration, efficiency and creativity in students. We’ve seen it first hand at St. Matthew’s, and it has been proven that technology-transformed intervention advances learning by raising test scores, reducing drop-out rate, and improving discipline (ProjectRED.org). In short, access to technology in today’s world is absolutely essential. We have reaped the benefits of iPads in the learning environment here, and feel more young learners should have access to this incredible learning tool. Our vision is to inspire students to see their own strength and potential for achievement in challenging educational environments. Through the use of innovative and relevant technological tools, students will take away not only new academic skills, but also pride in their accomplishments and a desire to follow their passions. We ask three things of our participants: Work Together. Have Fun. Be A Scholar. As our program and goals continue to expand, the Lucas Scholars Program seeks to continue to expand its services to more communities-in-need throughout Southern California. Mrs. Ward began teaching Earth Science and Life Science at St. Matthew's in 2009 after previously teaching Advanced Placement Biology to high school students in the Midwest for three years. She graduated from Williams College, majoring in Psychology and Neuroscience and competed on the volleyball and rowing teams. She spent most of her life as a student in independent schools and strongly believes in their learning philosophy. She hopes students in her classes learn how to think like scientists and question how the living world around them works from tiny bacteria to entire ecosystems. Her current passion is getting students excited about evolution and scientific research through the Guppy Project, started in 2010. Mrs. Ward was the co-chair of St. Matthew’s Parish School’s school-wide Diversity Committee, and she was a Lucas Fellowship recipient in the summer of 2010.